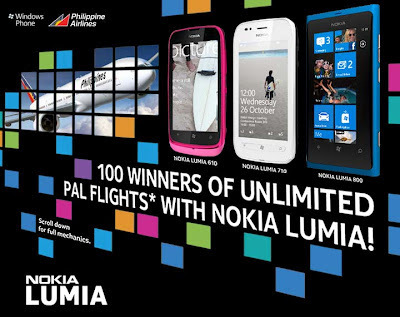 Unlimited PAL Flights w/ Lumia ~ Philippine Freebies, Promos, Contests and MORE! Pack your bags and get ready to travel the country in Nokia Lumia's Unlimited PAL Flights promo! Nokia Lumia users just need to text in I CAN LUMIA [FULL NAME]/[ADDRESS]/[IMEI] then send to 2960 (Globe and Smart subscribers). Standard P2.50 charge rate per text applies. One (1) IMEI sent is equivalent to one (1) raffle entry. Get your name drawn and be one of the 100 lucky winners of unlimited Philippine Airlines flights (i.e. 4 consecutive weeks unlimited roundtrip domestic flights) destined for Legazpi, Kalibo, Cebu, Tagbilaran, Davao, and Puerto Princesa.